A one-bedroom apartment on the fifth floor of a 18th-century building with an elevator. Located on a small and quiet street adjacent to Rue du Bac, footsteps from Bvld St Germain, and facing the Basilica Ste Clothilde. (Metro Solferino). Walk to Musee d'Orsay, Eiffel Tower, Le Louvre. Walk to the shopping area of Rue du Bac, famous Bon Marche and la Grande Epicerie de Paris. Spaciously organized with an area of over 70 square meters (778 square feet), the apartment offers ample living space with a luminous salon, comfortable bedroom, fully-equipped kitchen, and a modern bathroom. There is wrapped around balcony overlooking the magnificient Basilica Ste Clothilde. Elegantly furnished, the apartment comes with a range of services included such as housecleaning once a week, TV with cable, access to Internet, telephone for local outgoing and all incoming calls, most internation phone calls. Ideal for 2 people, may sleep 4 maximum. A charming, classy apartment, in a quiet neighborhood, yet close to major points of interest. Would certainly return. Overall an excellent experience. We had a wonderful 1 week stay. Check in and out was easy and the apartment has a charming traditional French apartment feel with with great view. The apartment was spacious, comfortable, clean, and with a lot of natural light. Perfect place for people who would like to experience Paris as locals and not as tourists. I loved the apartment and the location. The building has a lot of character and the location could not be any better. I highly recommend this place because nothing went wrong! The unit is located in a quiet area, but just an easy 15 minute walk to the Eiffel Tower and the historic market street near it, the Concord/ Rue Saint Honore area ( which is also an easy subway stop to everywhere you want to go if you don't want to walk) and 10 minute walk to the Invalides metro/train area to Versailles, etc. or the Orsay museum in the other direction. The upper scale restaurant below the unit is great and it is just half a block to the supermarket. My only complaint would be the pillows on the bed as they are the Large Square French pillows, but I travel with my own anyway, so not a problem for me...just a heads up on packing if you are picky like me. 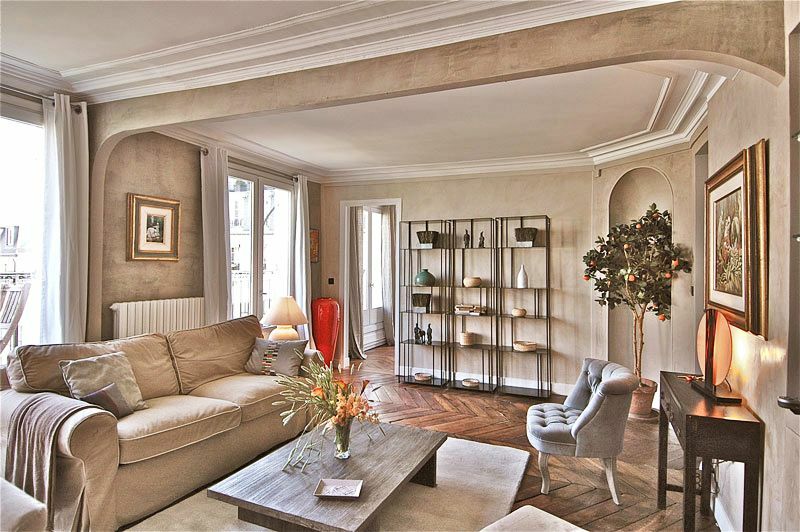 The Parisian apartment we wish we owned! Came to Paris to go out to dinner for our 40th anniversary, and immediately felt as if we were at home. Beautiful view of the cathedral from the terrace where we sat and drank wine every evening. Great area, within walking distance of many sites and amenities. Had a wonderful time! We had a fantastic stay in this flat! It is away from the touristy areas, so it was very quiet in the evenings. Our favorite part was the terrace that overlooked the rear of the Basilica. We would sit on the terrace to eat dinner and drink wine while watching the sunset. The flat is well stocked with accessories (hair dryer, cooking utensils, iron and ironing board, etc). The clothes washer/dryer was fantastic to have! There was a bit of a heat wave during our stay, so we ended up washing clothes a few times. The owners had a portable air conditioner for us to use because of the heat wave. It kept us very comfortable. Stays less than 6 nights: 400€/night regardless of the season Rates are subject to change without notice.